Just look at that number. Absolute unit, honestly. The DC Universe subscription service offering access to archives of classic TV and movies, a selection of the company’s comics archives, and some pretty dang great new TV to boot made the lofty $75-a-year price tag worth swallowing. But now DC has made the whole thing even more tempting by making the comics aspect arguably what it should’ve been from the start. Unveiled at WonderCon this past weekend with a host of other tidbits for the service, DC announced plans to vastly expand the current crop of comics available to read as part of its all-in-one subscription platform to now include over 20,000 issues from the company’s archives. On top of that, DC will also begin regularly adding new issues from its currently-running series, set to hit DC Universe 12 months after they first hit comic store shelves—akin to how Marvel currently handles its Marvel Unlimited subscription service, although Unlimited only waits around six months before adding newer titles. It’s a huge boon to DCU’s comics corner—the service launched last year with a limited selection of titles that were curated and swapped out regularly, before expanding to encompass a larger library of comics in January of this year. This current expansion brings the service’s comics library in-line with others like Marvel Unlimited; it’s by no means a complete collection, but still incredibly extensive. Enough that you’ve got books to read for a damn long time. 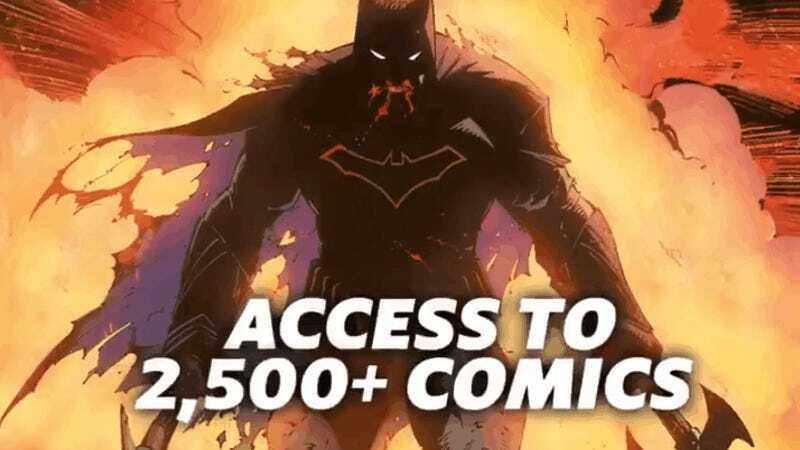 But considering it’s all that, and access to shows like Doom Patrol, Titans, and Young Justice, as well as back archives for things like Batman: The Animated Series’ HD remaster? It makes the service even more tempting than it is...and also a lot more frustrating that it’s U.S. only. Hopefully, as it’s figured out ways to bring the Universe-exclusive shows beyond U.S. shores over the past few months (still waiting on that Doom Patrol Netflix announcement, DC, any day now please! ), it’ll find a way to offer the comics library that’s now part of Universe as a standalone thing internationally. No specific dates have been given for just when DC Universe will add these new comics to its library beyond April, so for now...just sit tight and wait for your digital reading pile to suddenly get a lot larger.